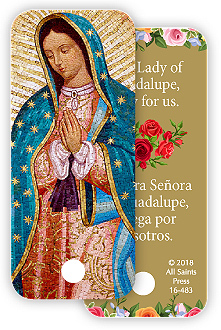 This small and durable plastic key tag slips on to any key ring with a reminder to pray and contemplate during the feast of Our Lady of Guadalupe. Features "Our Lady of Guadalupe, Pray for us on the back (Spanish and English). A great handout for the season and beyond. This keytag is bilingual.